At the dawn of this new decade, the gods are smiling on many of us in Tasmania. Most of the island’s once-parched east, south-east and midlands have been favoured with good spring rains bringing a bountiful growing season. Now we’re enjoying a summer to die for. In these times, waking up to one beaming day after another, we don’t need to ask ourselves why we live in this place. Whatever our personal circumstances, it’s hard not to feel blessed. The Bureau of Meteorology’s statistics for 2009 give some support to this feeling. Last year we had the best rain statewide since 1996, with the south-east getting a thorough soaking, notably in some of its most drought-affected parts. Some memorable examples: the unforgettable sight of late-winter rainfall overflowing Craigbourne Dam near Colebrook, which had languished all but empty for years, and dry-as-dust Nugent, Bream Creek and Maria Island, where rain was becoming a rarity, enjoying an absolute drenching. Hobart’s 862 mm made 2009 its wettest year since 1958. On Mt Wellington, where I live, we had close to double the average of the previous decade or so. You can almost watch the plants shooting and growing, and for the first time in years the grass needs cutting. It never rains but it pours. The Bureau reported a number of two- or three-day events causing flooding, notably in eastern parts in winter and early spring. Almost all the state’s rivers flooded at some time in August or September, with the prize going to the South Esk floods on August 13. More negatives: we barely saw the sun all winter, not good for the spirits or vitamin-D or solar hot water. And Tamar Valley people enduring bushfires, or anyone who lived through Hobart’s 1967 fires, won’t need reminding that faster growth also means more fuel for fire. The prolific vegetation on the slopes around my mountain home is a sobering reminder of what might be. Wind was another feature of 2009. August was one of the windiest months on record, with winds on Maatsuyker Island reaching 174 km/h, and Scottsdale was dealt the state’s second strongest wind gust on record — 194 km/h. Tasmania had hot and dry winds late in January, but unlike Victoria it was spared major bushfire damage. Which brings us to temperature. It may not have felt like it, but 2009 was a warm year for Tasmania — not a record but well above average. The warmest weather was in the north and north-east late in January, when a heatwave took temperatures to record highs, including the highest Tasmanian temperature ever recorded: 42.2C at Scamander. If Tasmania was warm, Australia as a whole was warmer, beaten only by 2005 for the dubious distinction of the warmest year ever. The second half of last year was Australia’s warmest ever July-December period. Most of NSW, a large part of South Australia and north-western Victoria had their warmest year on record. The Bureau’s 2009 report includes a decadal trend graph covering the past 100 years — a big help in cutting through the “noise” of daily, seasonal and annual fluctuations to get a handle on the underlying direction of temperatures. The graph shows a steady warming for more than half a century. 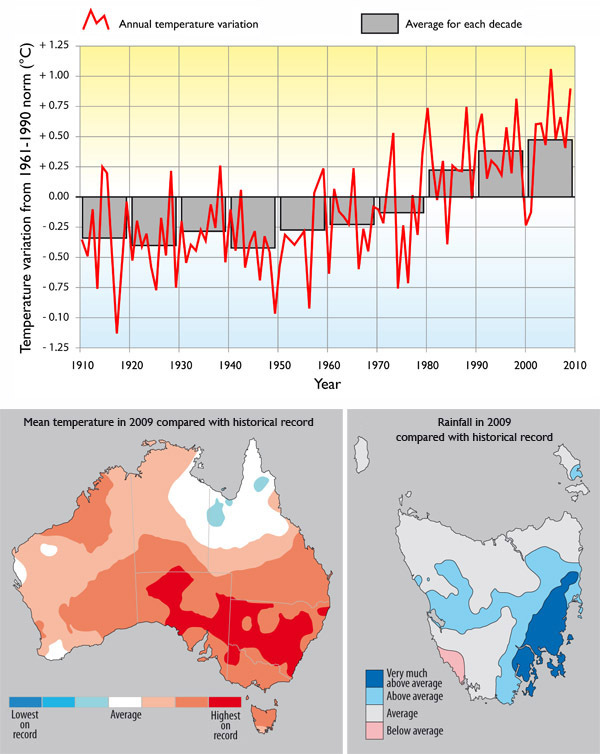 Each of the six decades since the 1940s has been warmer than its predecessor, and the decade to the start of 2010 was the warmest in the 100 years since Australia began keeping high-quality records. While Tasmania enjoyed a moist change, other parts of Australia had one of their driest years. Worst affected were the Top End, central Australia, south-west Western Australia, south-east Queensland and the eastern half of Victoria, still reeling from the February bushfires. The global temperature story is similar to Australia’s. Last year, 2009, was the fifth warmest year since records began in the mid-19th century, and the decade just ended was the warmest ever recorded. It’s now a quarter of a century since the annual global mean temperature last dipped below the 1961–1990 average, the standard benchmark against which contemporary observations are measured. That last “cool” year was 1985 — yet at the time it was one of the dozen or so warmest years on record. How times have changed. We’re now in one of the biggest solar minimums ever known, when low sunspot activity should be causing our temperatures to fall. Yet they remain stubbornly high, and we know why. We know we have to find a way of turning around the relentless upward trajectory of our heat-trapping carbon emissions. When we celebrate our life in this mini-paradise (as we should), I suggest something like a grace before the Christmas dinner: Thank you, Providence, for these good times on this blessed island, but let us reflect for more than a moment that good fortune never comes free. “Ten steps to a safer climate”, a set of strategies put together by concerned Tasmanians late last year, will be launched at 12 noon today at the Waterside Pavilion, Mawson Place, Hobart. With a State election in March, “Ten Steps” offers political leaders a way to make Tasmania a leader in reducing carbon pollution. This entry was posted in carbon, carbon emissions and targets, changes to climate, climate system, community action, future climate, natural climate influences, natural events, science, social and personal issues, social mindsets, temperature, water and tagged Australia, Bream Creek, Bureau of Meteorology, bushfire, climate change, climate strategies, Colebrook, Craigbourne Dam, global warming, Hobart, Maatsuyker Island, Maria Island, Mt Wellington, Nugent, Peter Boyer, Scamander, Scottsdale, Tamar Valley, Tasmania, Victoria. Bookmark the permalink.